The Queensland Prawns project is designed to encourage people to seek out Queensland Prawns from markets, fishmongers, retailers, supermarkets and restaurants. If you want to display the Queensland Prawns logo to identify your product, or you would like some help in creating press, radio or television commercials promoting your stock of Queensland Prawns, we are happy to help any QSMA or APFA member do this. Keep an eye out in the future for templates and assets you can use in your marketing and promotion of Queensland caught or grown prawns. We have three Queensland Prawns logo versions for you to use (see right; 1 - 3). If you want a high resolution copy of the logo or you would like to know more, please email us. 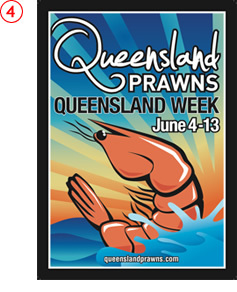 Seafood retailers wishing to join in the "Eat Queensland Prawns during Queensland Week" event can download an A4 poster to print out and display at your premises (see right; 4). Click here to download the print ready PDF file [860 KB]. If you would like the poster in a larger size to supply to your printer, please email us. To download a broadcast quality version of our "Eat Queensland Prawns on Qld Day" movie, right click and select "save link as" to save the file to your hard drive. Format: Quicktime Movie Avc1 1280x720 millions 25 FPS.